At the 4th September 2016 H!P Kenshuusei Happyokai evening performance, a 'KobuTalk' segment was held with Kobushi Factory members Fujii Rio and Hamaura Ayano as well as Kenshuusei Takase Kurumi and Kiyono Momohime. 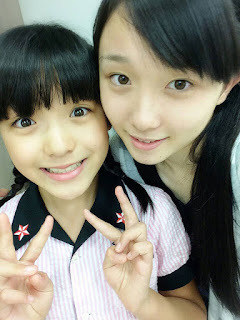 The theme was 'Members that love Tsugunaga Momoko'. Which begs the question of why notorious Yaji-oshi Fujidon was doing there. Makoto: Their stories of their admiration of Tsugunaga-san will be balanced out by her love of Yajima-san. Takase goes into further details about how Momochi leads Country Girls and keeps them in order. She also enjoyed Momochi's expressions at the Buono! Budokan, where she got teased and babied by the other members. Hamachan talked about how Momochi glances upwards and to the left after she's done singing a solo part, using examples from 'Mousou Rehearsal'. Kiyono elaborated on the way Momochi pronounces her 'Koyubeam' - her 'ko' sounds close to a 'ka'. Kiyono's attempt at a 'K(a)oyubeam!' was met with approval by the wota. Kiyono started collecting ribbons because she'd heard that Tsugunaga-san had been collecting them expressly for her Momochi Musubi, and she wanted to have a hobby in common. Kiyono now has a collection of 100 ribbons. Takase: Her eyelashes and her lips. Takase even has an 'eyelash and lips' folder in her smartphone, with photos focusing on both of those aspects. Hamachan is known for her love of Tsugunaga Momoko, so she receives Momochi goods and photos. It's also well known that she has a file where she keeps the Momochi items she's received. 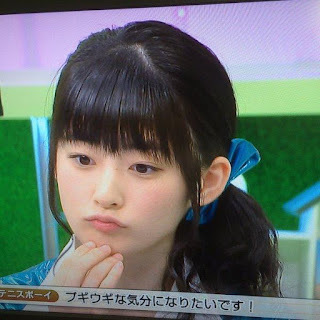 The ball-point pens and mechanical pencils Hamachan uses at school are also Tsugunaga-san's, and she always keeps her Momochi card case hanging around her neck. Makoto-san asks Fujii-san if she'd like to share any stories of Yajima-san, having listened to the stories of the Tsugunaga Momoko-loving members from beginning to end. While Fujidon suspects that most people are familiar with her many incidents with Yajima-san, she has a recent story to share. She's recently been into using a face-switching app. The other day, she switched faces with Yajima-san's photobook, and proceeded to send that photo to the other members. Fujidon was brought forward to do a Yurushite-nyan. having done that, the Momochi-loving members then criticised her performance. Firstly, Fujii's head was completely straight. Hama: Incline your head a little to the left. (Fujii inclines her head to the left, from the audience's point of view. )Hama: That's the right. After all the advice, Takase judged Fujii to be at her cutest, which lifted Fujidon's spirit. Finally, the corner ended with all four of them doing the Yurushite-nyan.